How To Treat Gifts And Bequests From Foreign (Non-US) Persons | TaxConnections is a where to find leading tax experts and tax resources worldwide. If you are a US citizen or resident and you receive gifts or bequests (generally, an inheritance or gift of property by a Will) of money or other property from a foreign (non-US) person or entity, you may need to report these gifts on Form 3520, Annual Return to Report Transactions with Foreign Trusts and Receipt of Certain Foreign Gifts. Form 3520 is an information return, not a tax return. Many people receiving gifts or bequests get very confused. They mistakenly believe that they have to pay tax when they receive a gift or bequest. This is not the case – bona fide gifts or bequests are not subject to income tax in the hands of the recipient. This remains the case regardless of whether the person giving the gift is a US person or a foreign person. It remains the case regardless of the amount of the gift or bequest. On the other hand, the giver of the gift (even if he is a non-US person) may have US Gift Tax consequences when he makes a gift; and a decedent’s estate from which the bequest is made may have US Estate Tax consequences, even if the decedent was a non-US person. These are very distinct from the tax issues for the recipient of the gift or bequest. While the recipient of the gift or bequest will pay no tax on what he receives, there may be reporting duties imposed on the recipient if the gift or bequest is from a foreign person. A “foreign person” is a nonresident alien individual (NRA) or foreign corporation, partnership or estate. If you receive a foreign gift or bequest check carefully if you must file Form 3520. This is discussed more fully, below. Is it a True Gift? In general, money or other property received by a US person as a gift or bequest is not taxed – that is, it is excluded from the recipient’s gross income. If the transaction does not reflect a true gift, however, the IRS may re-characterize it and treat it as it should be treated according to the substance of the transaction. Take this as an example: Mr. Architect, a US citizen, designs and plans a home for Mr. Rich, a NRA. The parties agree that instead of Rich paying Architect a fee for his services (say, this fee would be $90,000), Rich will make gifts of the amounts instead in equal sums to each of Architect’s three children. Are these bona fide gifts from Rich to the children? No. The IRS can re-characterize the transaction as follows: Rich will be viewed as paying the service fees of $90,000 to Architect. Architect will be responsible to include these amounts in his income and to pay income tax on these amounts (including Self-Employment tax). The gifts to the 3 children will be viewed as being made by Architect to each of the children and Gift Tax will be assessed since the amounts per child exceed the annual exclusion of $14,000 per person. If you receive a foreign gift or bequest review whether you must file Form 3520. Form 3520 is required, if, during the current tax year, you receive gifts or bequests exceeding certain amounts. Gifts valued at more than $15,102 (this is the 2013 amount; the threshold amount is adjusted annually for inflation) from foreign corporations or foreign partnerships (including foreign persons related to the foreign corporations or foreign partnerships). 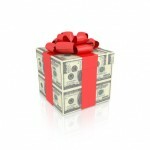 Gifts received from related parties must be aggregated to determine if the dollar threshold has been met. For example, if you receive $80,000 from NRA X and $25,000 from NRA X’s brother, you must report the gifts on Form 3520 because the total is more than $100,000. Report these gifts in Part IV of Form 3520. On the other hand, if you receive $80,000 from NRA X and $25,000 from NRA Y and they are not related, you have no duty to file Form 3520. Gifts received from foreign trusts are treated differently – very generally, gifts from foreign trusts are viewed as trust distributions and must be reported on Part III of Form 3520. Trust distributions are generally taxable income to the beneficiary who receives them. Form 3520 is filed separately from your income tax return. The due date for filing Form 3520 is the same as the due date for filing your annual income tax return, including extensions. Remember, Form 3520 is an annual return. You must examine all foreign gifts and bequests you receive during each taxable year to determine if the Form is required to be filed for that particular year. Under a new law that became effective June 17, 2008, gifts or bequests from so-called “covered expatriates” may be taxable to the US person receiving that gift or bequest. A “covered expatriate” is an individual who was a former US citizen or long-term permanent resident (generally a person who held a green card for 8 of 15 tax years before surrendering the card) if the individual met certain other requirements. A gift or bequest from such a “covered expatriate” that exceeds the annual exclusion amount (US$14,000) may be taxed to the recipient at the highest gift or estate tax rate in effect at the time of receipt. Currently, the highest Gift and Estate Tax rate is 40%. This special punitive tax regime is generally designed to recoup the Gift or Estate taxes the US government would have received had the individual not given up his US citizenship or green card. Since the government no longer has jurisdiction over the former US person, it must impose the tax on the US recipient of the gift or bequest. The tax has been harshly criticized since it makes no provision, for example, for the lifetime exclusion amounts using the Unified Credit.